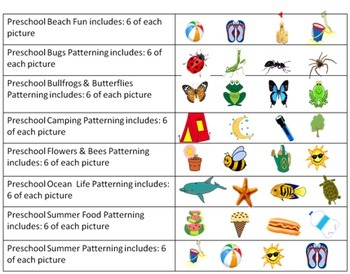 This 8 set patterning pack (27 pages) uses colorful, summer like objects to attract children of any age, while enhancing their interest in developing simple AB patterns. 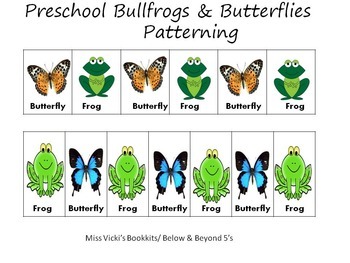 With a little practice using these hands on teaching tools children can begin to construct more complex patterns such as ABBA or ABCABC. The possibilities are endless. 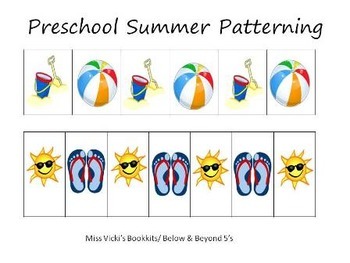 With minimal teacher prep- copy, cut and laminate this product is a must have for small group activities, math centers and even language centers as all patterning pieces are labeled to help children with making that connection between written and spoken words. 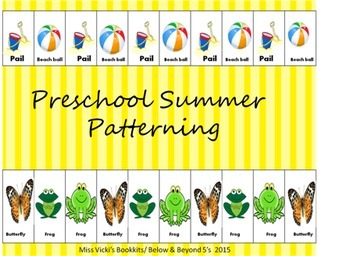 Patterning Skills meet: Indiana Academic Foundations and Standards and Common Core. K.RF.4.1 Use letter-sound knowledge to decode the sound of each consonant (e.g., dog = /d/ /g/; soap = /s/ /p/). K.CA.4: Find the number that makes 10 when added to the given number for any number from 1 to 9 (e.g., by using objects or drawings), and record the answer with a drawing or an equation. K.CA.2: Solve real-world problems that involve addition and subtraction within 10 (e.g., by using objects or drawings to represent the problem). M.6.14 Reproduce simple AB patterns of concrete objects. M.6.15 Predict what comes next when shown a simple AB pattern of concrete objects. M.6.17 Give reason of placement of objects. M.6.9 Identify which is “more” visually, tactilely, or audibly. M.5.26 Categorize familiar items by function and class. SC.1.7 Use charts, drawings, and/or graphs to share their findings with others. SC.1.20 Manipulate a variety of objects and tell about what is observed (e.g., more than, less than, equal to/same). SC.1.31 Participate in activities related to number sequencing and counting. SC.1.52 Participate in activities using materials with a variety of shapes and patterns. ELA.2.32 Name 13 uppercase letters. ELA.2.33 Point to and name six letters. ELA.2.40 Match upper to lower case letters. ELA.3.10 Distinguish print from pictures.